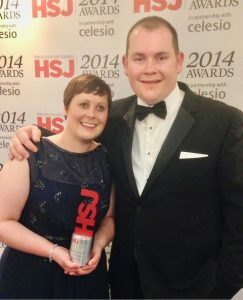 Tameside Hospital in Greater Manchester is set to appoint up to 15 Kate Granger nurses. This new post has been developed in collaboration with the late hospital consultant’s husband, Chris Pointon, as a way of continuing the incredible work Kate began back in 2013. The ‘Hello my name is…’ initiative was set up by Kate and her husband in 2013, following Kate’s terminal diagnosis with sarcoma in 2011. Kate, who worked as a Geriatrician at Mid Yorkshire Hospitals NHS Trust, felt that whilst the standard of care she received was good, she often never knew the names of the people responsible for providing her care. Knowing their name was a simple, yet very effective way of building a bond with her care givers and Kate set out on an inspirational quest to make sure all healthcare staff across the country introduce themselves by way of ‘Hello my name is…’ – it became known as the Hello my name is campaign and received global recognition. Kate, who sadly passed away on 23rd of July 2016 at St Gemma’s Hospice, in Leeds, has inspired staff in Tameside and Glossop to carry on her legacy and appoint a whole cohort of nurses that will continue the drive for standards of compassionate care. These new nurses will be known as Kate Granger nurses and carry specially designed badges with Kate’s name and will be tasked with ensuring the organisation continues to live the values and standards we remember Kate by. Chris Pointon will deliver a speech to the new nurses at a recruitment event on 19th July, find out more and register your interest in attending here. Which of the following departments are you keen to work in? Are you a Qualified Nurse/Midwife? Are you a Student Nurse/Midwife? Are you an experienced HCA? Flexible working opportunities. Rotational posts to explore a wide range of areas. Career development opportunities. Health and wellbeing provisions. Range of staff benefits.